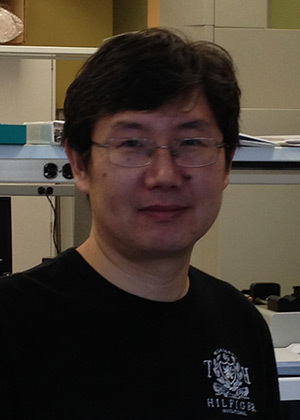 Dr. Yu Liu is interested in the regulatory mechanisms of early embryonic development. At the early stages of life when the embryo comprises only a few hundreds of cells, cellular differentiation and organogenesis are highly dynamic and regulated by powerful factors such as pioneer transcription factors and non-coding RNAs. By learning these processes, Liu hopes to provide unique insights into human diseases and develop novel approaches to treat them. Liu’s recent work on miR-322/503 exemplifies a typical approach. Using mouse genetic tools, the lab identified miR-322/503 as one of highest enriched microRNA clusters in early heart progenitor cells. Next, they learned that triggering the expression of miR-322/503 was sufficient to drive heart muscle cell differentiation in a cell culture system. Currently, Liu is using animal models to address how ectopic expression (transgenic) or deletion (knockout) of miR-322/503 affects normal heart function and the outcome of ischemic heart diseases. Wang F, Liang R, Soibam B, Yang J, and Liu Y. Coregulatory long non-coding RNA and protein coding genes in serum starved cells. Biochimica et Biophysica Acta. 2019. 1862(1):84-95. doi: 10.1016/j.bbagrm.2018.11.004. Liang R and Liu Y. Tcf7l1 Directly Regulates Cardiomyocyte Differentiation in Embryonic Stem Cells. Stem Cell Research & Therapy. 2018. 9:267. doi: 10.1186/s13287-018-1015-x. Shen X, Bao W, Yu W, Liang R, Nguyen B, and Liu Y. An improved method with high sensitivity and low background in detecting low b-galactosidase expression in mouse embryos. PLoS One. 2017. 12(5):e0176915. Liu Y and Schwartz RJ. Transient Mesp1 expression: a driver of cardiac cell fate determination. Transcription. 2013. 4:1.